As to my present state of health, you will be able to judge that easily enough from my shaky handwriting. It is true that as regards my strength, that is beginning to come back, and nothing remains, besides, of the pain in my chest; but the ulcer is working on my windpipe. The Roman historian Cassius Dio confirms that Marcus had problems with his chest. He adds that he also had a stomach condition and “took but very little food and that always at night”. He says that Marcus used the traditional compound known as theriac, which contained a small amount of opium, to help him endure the discomfort caused by these problems. For it is on behalf of the State that I continue to toil and to undergo dangers and that I have spent so much time here outside of Italy, though already an old man and weak, unable to take either food without pain or sleep without anxiety. This difficulty sleeping appears to have troubled him for years, perhaps as a result of his other health problems. He mentions more symptoms in The Meditations where he thanks the gods “that remedies have been granted to me through dreams, especially against blood-spitting and dizziness” (1.17). It’s impossible to diagnose Marcus’ health problems accurately in retrospect. He probably developed several different conditions at various stages in his life. However, some modern scholars have speculated that he suffered from chronic stomach ulcers, among other things. To be sure, he could not display many feats of physical prowess; yet he had developed his body from a very weak one to one capable of the greatest endurance. He doesn’t mean that Marcus was physically strong. He means that though physically frail, and prone to illness, he was nevertheless surprisingly resilient. He outlived many of his contemporaries, almost reaching the age of sixty, despite being surrounded by plague and stationing himself at the front during the Marcomannic wars. I believe that, in part, Marcus became more physically and mentally resilient through his training in Stoicism. 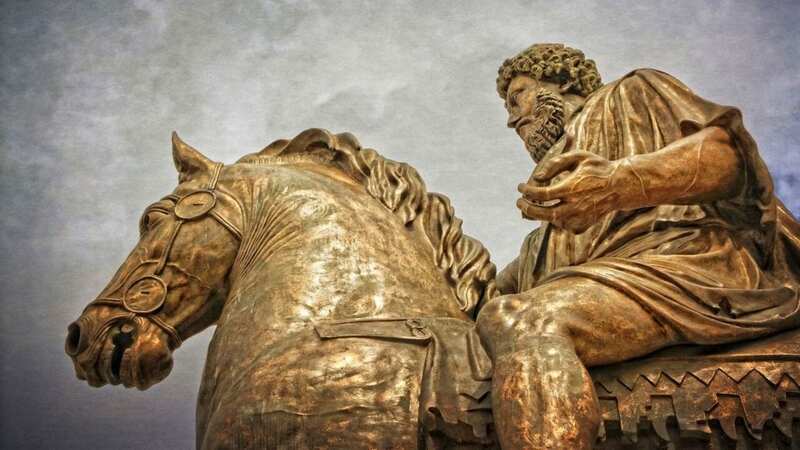 There’s a chapter dedicated to Stoicism and pain management in my book How to Think Like a Roman Emperor: The Stoic Philosophy of Marcus Aurelius. He doesn’t give us a neat summary of the practices he employed. We have to analyze the text and reconstruct his approach from various scattered remarks. However, coping with pain is a topic that he returns to quite frequently. Rather than dissect what he says in The Meditations, I’ll just give you some of the key strategies, described in plain English. Some of these resemble techniques used in modern cognitive-behavioural therapy (CBT) for pain management. I’ll intersperse a few comments about how to practice them based on my own experience as a cognitive psychotherapist. We do something like this in modern therapy to help build motivation for change, which research shows is actually one of the most important ingredients determining success. The Stoics very frequently refer to a similar technique. In typically Laconic fashion, they often prefer just to remind themselves of the paradox that our anger or sorrow often does us more harm than the things we’re upset about. The majority of people take it for granted that pain is harmful, because it hurts. However, the Stoics argue that pain doesn’t necessarily do us any real harm because it doesn’t affect our moral character unless we allow it to do so. The real harm comes from allowing ourselves to wallow in pain or become frustrated with it because those emotions injure us at a much deeper level. A more thorough way of exploring this perspective is to imagine yourself standing before a fork in the road leading into your future. On the left is the path of “passion” (or rather pathos, emotional suffering). That entails wallowing in your pain or feeling angry or frustrated about it, viewing it as awful or catastrophic. Imagine where that road leads if you continue down it, months and years from now. On the other hand, to the right, is your future down the road of “reason” and Stoic virtue – the road of wisdom, self-discipline, and endurance. Imagine how that leads in a different direction, and how the two paths diverge further and further apart as the months turn into years. Having a vivid sense of that contrast, between the good and bad long-term consequences, can help us to find the motivation required for change, which often requires some effort and persistence to achieve. 3. How Awful is the Pain? Is it really the end of the world? When we’re upset we tend to make events seem more harmful or threatening. Cognitive therapists describe this as “catastrophizing”. The Stoics question how unbearable pain is by asking themselves whether they’re capable of enduring worse. Perhaps you’ve experienced worse in the past? Perhaps other people have endured worse and knowing that can (sometimes) help you view the discomfort as something less severe, relatively speaking. Another way of doing this is what I call “Depreciation by Analysis” (you could perhaps also say “Decatastrophizing by Analysis”). That entails dividing the experience up as much as possible into smaller and smaller parts, which you can deal with separately in a piecemeal fashion. I also like to describe this as using a “divide and conquer” strategy to overcome our suffering. Remaining centred in the present moment is perhaps the simplest way of isolating the experience. Focusing on the transience of sensations can also help, e.g., by reminding yourself that the pain will be gone eventually or that it comes and goes over time. Often pain feels less overwhelming if we just focus on coping with the here and now and forget about what lies beyond that – taking it one step at a time. Marcus several times refers to a famous Epicurean saying that pain is either severe but short-lived (acute) or chronic and less severe. People cope, that is, by focusing on the knowledge either that their painful sensations are temporary or that they could be much worse. Either way, as Marcus tells himself, it’s never truly unbearable. 4. What Ability do You Have to Cope? One of the earliest cognitive theories of stress, developed by Richard Lazarus, is known as the transactional or “seesaw” model. It says that psychological distress is often due to an imbalance or disparity between two factors: our perceived ability to cope and the perceived severity of the threat we face. If you believe that a threat is minor (“It’s not a big deal”) and your ability to cope is strong (“I can handle anything!”) then you won’t be very stressed. At the other end of the scale, if you believe that a threat is extremely serious (“This is a catastrophe!”) and that you’re totally incapable of coping (“I just can’t handle it!”) then you’re probably going to freak out. We’ve already seen how the Stoics challenge and re-appraise the perceived severity or awfulness of a threat such as physical pain or illness. They also address the other side of the equation, though, by asking themselves two types of question about coping: “How would someone you admire cope with the same problem?” and “What resources (virtues) has nature given you that could help you cope?” Some people cope well with pain and illness. Other people cope very badly with the same set of challenges. Marcus saw many examples on both sides and he chose to spend time carefully and systematically meditating on the example provided by those who coped well. He studied their characters and ways of thinking and sought to emulate what he learned from them. We can see him doing that in book one of The Meditations, for example, where he notes how his Stoic teacher Apollonius of Chalcedon consistently maintained his commitment to reason and virtue, without complaining, despite enduring severe pain and long illness (1.8). If we take time to reflect on the strength of character others have shown when enduring health problems we can often gain inspiration and learn from their attitude. Doing so may also increase our own self-confidence, or perceived coping ability, which leads to reduction in stress and emotional suffering. Looking at ways we’ve managed to cope with similar problems in the past and potential skills or resources that we could apply now can have a similarly positive effect on our self-confidence. In short, the more we think constructively about ways we could cope better the more confident and less upset we tend to feel, even when experiencing major challenges such as chronic pain or illness. Perhaps all of these strategies converge on the basic Stoic attitude of accepting painful or unpleasant sensations and viewing them with studied indifference. This is a major theme in modern evidence-based approaches to psychological therapy, including pain management. Indeed, we often refer to various modern forms of cognitive-behavioral therapy as the “mindfulness and acceptance-based” approaches. When people become frustrated with unpleasant feelings and try to control, avoid, or suppress them, research suggests that often backfires by making their suffering worse. One obvious reason for that is that when we perceive something as very bad or threatening – such as chronic pain or illness – we naturally tend to dwell on it to the exclusion of other things, as though putting it under a magnifying glass. That just tends to make the whole experience worse. What’s the alternative, though? Well, it seems we’re all capable of learning to actively accept unpleasant feelings, even physical pain and other symptoms of illness. The Stoics and their predecessors, the Cynics, appear to have already grasped the paradox of acceptance, thousands of years ago: accepting pain rather than struggling against it often makes it more bearable. The Cynics used to say that sensations of pain are like wild dogs chasing us. If we panic and try to run from them they’ll give chase even more fervently, snapping at our heels. However, sometimes a wise and courageous individual who does the opposite, and turns to face them calmly, may cause the hounds of pain to cower and back away with their tails between their legs. When we face pain, gradually over time, and actively accept it, it often becomes less threatening. (We overcome FEAR when we Face Everything And Recover.) Dio Chrysostom, a Sophist who studied under the great Stoic teacher Musonius Rufus, said it’s like a boxer who fares better if he’s prepared to be struck a few times and to accept the blows with relative indifference. If, on the other hand, he keeps shrinking nervously away from his opponent, he may expose himself to a worse beating. He also compared enduring pain to trampling out a fire – if we do it gingerly, we’re more likely to be burned than if we stamp on it confidently. Children even make a game of quenching flames on their tongues, by doing it quickly and confidently, he says. Today, we speak of “grasping the nettle” to make the point that facing something and accepting it often leads to less injury than approaching it hesitantly and defensively. (If you brush against a nettle, you’ll get stung; if you hold the nettle tight in the right way, pressing the sharp spines flat, you’ll prevent it stinging you.) By calmly grasping the nettle of pain rather than struggling against it, resenting it, or complaining about it, we can learn to suffer from it less. He who learns how to suffer well suffers less.